Property Details: 2 Bedroom, 2 Bathroom Condo with 800+ sq. 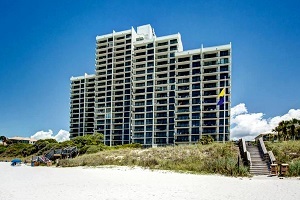 ft.
South Walton Real Estate beach condo, One Seagrove Place home for sale. Beachfront Condo in a very desirable location. This is only the 2nd residence for sale in One Seagrove Place this year. This 14th floor gulf-front home has incredible views of the Gulf of Mexico. The kitchen and living area have been nicely renovated with new appliances and furnishings. One Seagrove Place is located in a highly desirable area on along Scenic Hwy 30A, between Seaside and Rosemary Beach. Come see this amazing beach home at One Seagrove Place Condo in 30A-South Walton Florida. In South Walton-30A on the Florida gulf coast, the same sugar-white beaches and turquoise water of the 16 unique beach neighborhoods has a variety of options for the ideal getaway. 30A-South Walton celebrates small-town beach life along Florida’s gulf coast. Since South Walton has an abundance of outdoor activities and events – hop on a boat, go parasailing, deep-sea fishing, or take a sunset cruise; maybe try your hand at kayaking, wave running, and stand up paddle-boarding. Or simply dive in and treat yourself to the exhilaration of a good, old-fashioned swim. The opportunities for water fun are as endless.